WinAVI FLV Converter is an easy-to-use software to download/convert FLV video files from Internet (e.g., youtube.com, video.google.com, kinds of vlogs, and etc). It supports to convert FLV from various video formats like AVI, WMV, RM, RMVB, iPod, MP4, PSP,and vice versa. WinAVI FLV Converter also supports to download FLV from Internet (building in MS IE) and convert to all popular video formats. It has an unmatchable speed and high quality. Pentium 3 PC or higher, 32MB RAM or more. 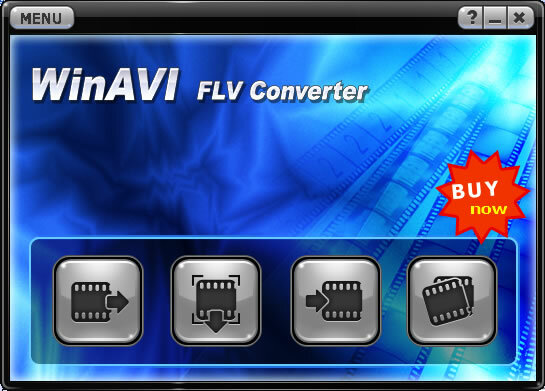 WinAVI FLV Converter can download/convert/transfer FLV files to local hard drive or portable video device from Internet. Just use this software to get a perfect and professional FLV for the Internet! 1. Fast convert AVI to FLV, MPEG to FLV, WMV to FLV and other popular video formats to FLV. 2. Convert FLV to iPod/PSP/MP4 that can be played on general portable video device such as MP4 player. 3. Download and convert FLV files from Internet, building in Microsoft IE. 5. World's fastest video conversion speed. 6. User-friendly interface that is easy to use. 7. Support to adjust volume/brightness/contrast for output files. 8. Support clip/zoom/soften the video. 9. Support audio and video sync function. 10. Support to select video decoder/splitter. Solved the problem on the compatibility between different decoders. Qweas is providing links to WinAVI FLV Converter 1.0 as a courtesy, and makes no representations regarding WinAVI FLV Converter or any other applications or any information related thereto. Any questions, complaints or claims regarding this application WinAVI FLV Converter 1.0 must be directed to the appropriate software vendor. You may click the publisher link of WinAVI FLV Converter on the top of this page to get more details about the vendor.